Wacky Cycling Inventions I’ve tried, Part II – Skewers! 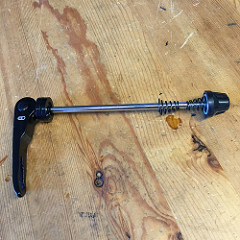 This post reviews two specialty quick-release skewers that I’ve tried. Though both showed promise and original thinking, ultimately neither made it into my permanent kit. This clever little product is designed to prevent wheel theft. The quick release contains a hidden pin that prevents the skewer from opening unless the bike is inverted. Upside down these work normally, but in other orientations they won’t open, preventing wheel theft by all but the most determined contortionist. Unfortunately I found them finicky, especially in foul weather. The pin would jam and prevent the skewer from opening even in the proper orientation. I didn’t want to be left cursing by the side of the road unable to fix a simple flat tire, so I reluctantly removed these from my city bike. This rear quick release incorporates a multi-tool in the lever. It adds only about 60 grams to the weight of a normal skewer. It’s not a bad idea and it’s well executed, but the tools are small and hard to access, for emergency only. They also tend to get pretty grimy down there near the road. I found that I prefer to carry a Ritchey CPR-9 multitool, which I can access easily and use with confidence. 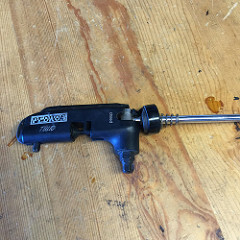 Still, this tool/skewer definitely works and its name is a clever Campagnolo pun.